On the Road to Emmaus, These Disciples Connected the Dots. Have You? 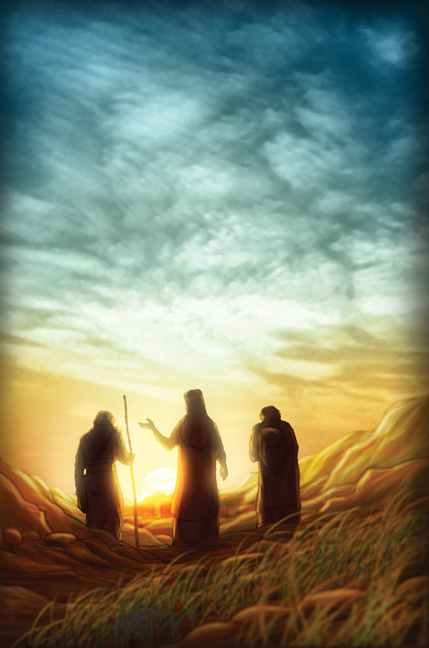 After the death of Jesus, several disciples were walking on the road to Emmaus, discussing the recent events. They were downcast because it had seemed to them that Jesus might have been the Messiah, but the crucifixion had shattered their hopes. As Gamaliel explained to the Sanhedrin in Acts 5, would-be messiah figures and self-proclaimed deliverers came along fairly often in occupied Judea, and this downcast group of travelers seemed ready to accept the bad news and move along. This whole Messiah thing had not turned out the way they expected– no victory over Rome, no Messianic kingdom… The strange Rabbi (who happened to be Jesus, but whom they did not recognize) joined their conversation and used the Prophets and the Scriptures to give them a more comprehensive view of the Messiah’s purpose and mission. Luke doesn’t tell us exactly what he said, but apparently it opened their eyes to some new possibilities about life and truth. Walking along the road, Jesus pointed out that the Old Testament was full of references to him and his work, something the disciples had not noticed and did not understand. The disciples had to see the larger context and lay aside their own preconceived notions about Jesus to see who he really was. As Hebrews 1:1 points out, “In the past God spoke to our ancestors through the prophets at many times and in various ways, but in these last days he has spoken to us by his Son…” It was ABOUT His Son that the Old Testament foretold. It is THROUGH His Son that God speaks today. What road are you on? Are you listening? And don’t just listen; while you are at it, connect the dots. A Rabbi joined their group and said, "This is no mystery! The Scriptures all foretold exactly how this came to be!" Revealing truth about Messiah's mission as they talked. And he revealed himself to them as they were breaking bread. And how their hearts were burning as he told them what he knew. But hear the word of God through Jesus: then, connect the dots.